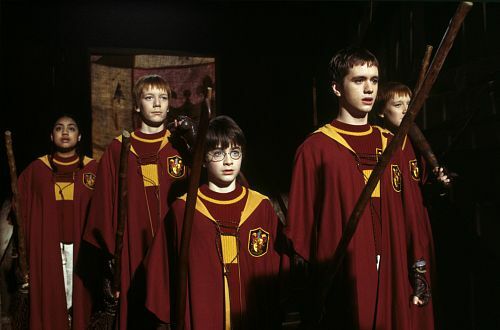 The Harry Potter film franchise remains the highest grossing in the history of cinema, though eventually it will be passed by the Marvel Cinematic Universe in 2015. The franchise consists of eight films with an average gross of $965 million each. Blimey. It's evident that this fanbase is gigantic to say the least, and the legacy left by Rowling's novels and Warner Bros. film series will never be vanquished. It's not easy to adapt the longest and arguably most boring Potter novel into a two hour film, and David Yates evidently did his best in attempting to generate some excitement from the mediocre source; but none of it really flourishes the way you'd hope. It boasts stunning visuals and a strong climax, but the fifth film in the series is simply too depressing and dull. It beautifully sets up the final stages of the series' narrative, but this isn't enough to really save it. None of the Potter films were ever able to top the first installment at the domestic box office ($317 million) until the eighth and final one - which sure says a lot about the immense hype surrounding the beginning of the franchise. This light hearted film is a lot more fun than its sequels, but suffers from a bloated run time and is hamstrung with mediocre child acting. Add in some cheesy visual effects, and you have an entertaining yet sadly flawed beginning of the series. Despite earning an incredible $878 million worldwide, Chamber of Secrets' earnings were down almost $100 million when compared to its predecessor. Perhaps this can be attributed to the usual fatigue franchises endure where future instalments hit the market, but still, the second entry to the Potter series was a lot better than the first due to a suitably dark tone and a much more compelling story. The actors are definitely improving here despite some hammy moments, and it makes for an all round entertaining watch. The decision to split the final Harry Potter book into two films has spearheaded an ungodly annoying trend in Hollywood of doing the same to every single concluding book adaptation, no matter its size or content. Before this ridiculous moneymaking scheme propped up, Potter actually did it to pretty surprising success; both movies feel relevant enough to coexist and tell the final story of the franchise. The first part suffers from sluggish pacing, but it remains an aesthetically stunning penultimate entry, and is further credited with some excellent performances from the entire cast. The sixth Potter book has a plot too thin to justify 600+ pages, but it surprisingly translated into a thoroughly a gripping film. With earnings of $934 million, $301 million of which came from the US alone, audiences seemed to agree; the story takes its darkest turn with the tragic death of Albus Dumbledore and the revelation of more sinister truths about Voldemort. Jarring tonal shifts are sometimes a concern, but Half-Blood Prince is still one of the stronger entries of the Potter canon. Though the third Potter film became the lowest grossing of the franchise both domestically and worldwide, it still impressed at the box office with a global haul of $796 million and arguably garnered some of the best reviews of the entire franchise. Under the direction of Alfonso Cuaron, Prisoner of Azkaban found a perfect balance between the complex nature of its story but also the fun and magical tone of the franchises younger years. The end result is an emotional, funny and highly enjoyable third film to the series. Goblet of Fire is where the franchise took a major dramatic turn, with the return of Voldemort and his loyal armies. The plot brings together a number of magical schools to compete in a wizarding tournament which Harry finds himself forced into - this allows the story to be a lot more dynamic and action packed than other entries, and the climax is without a doubt one of the most thrilling moments. The haircuts are kinda dumb, but hey, who cares. Good stuff. The culmination of this decade long film franchise earned $381 million in the US and a record breaking $1.3 billion worldwide, easily becoming the highest grossing film of the series and attracting a fanbase so large that $169 million of its US earnings came from its first weekend alone. Jeez. It's definitely worthy of such success, as it moves at a brisk pace in comparison to Part 1 and the Battle of Hogwarts is superbly portrayed. Around the destruction, the tension rises as our protagonists desperately try to vanquish the remaining Horcruxes of Lord Voldemort, who leads his armies on a huge final assault. The emotional stakes have never been higher, and thanks to excellent performances from the entire cast and some powerful emotional sequences, Part 2 easily becomes the best film of the franchise. Don't you dare reboot this, Warner Bros. Seriously.